It’s beauty-full! Bursting with tantalizing tulips, mini carnations and roses, this delightful pink arrangement brings spring joy to that special someone. Best Sellers Mothers Day - Full Of Love Vase. Florist Notes: Florist will use another flower of equal or greater value if tulips are not available. 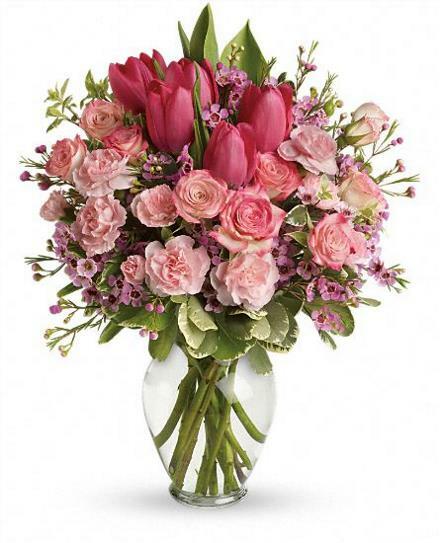 Arrangement Details: Includes pink roses, tulips, carnations and waxflower, accented with fresh greens. Delivered in a lovely glass vase.